Whether abortion should be legal or not has been a topic I'm extremely passionate about for a number of years. Personally, I am religiously against the idea of terminating a child, and I believe that every individual human life should be respected from conception all the way to It’s natural end. As stated in the Declaration of Independence, “We hold these truths to be self-evident, that all men are created equal, that they are endowed by their Creator with certain unalienable Rights, that among these are Life, Liberty and the pursuit of Happiness.” So, why is it we have deemed it acceptable to terminate a growing human child in their mother’s womb and completely strip away these rights? I believe the women of our country’s right to choose to abort a child should be abolished completely, or at the very least heavily restricted. A common argument made is that the child being aborted is not yet considered human. Our country is plentiful in interpretations of how life should be defined, and it is nearly impossible to confirm that one definition is correct. However, there are scientists siding with the belief that life begins at conception. A factual example of that is demonstrated in Dr. Maureen Condic’s report, “A scientific View of When life begins.” Which can be viewed at https://lozierinstitute.org/a-scie ntific-view-of-when-life-begins/. Another typical argument is that the fetus can't feel pain anyway. However, at http://www.mccl.org/unborn-babies-can-feel-pain.html Minnosota Citizens Concered for Life have argued that babies at 20 weeks have been known to physically react to outside stimuli. This has been observed by nurses and doctors through sonograms and live-action ultrasounds. You may be thinking, most abortions occur during the first trimester. This is a true statement that can be justified by the The U.S. Centers for Disease Control and Prevention. However, according to http://www.lifenews.com/2015/05/12/expert-told -congress-unborn-babies-can-feel-pain-starting-at-8-weeks/ Dr. Maureen Condic told congress, “To experience pain, a noxious stimulus must be detected. The neural structures necessary to detect noxious stimuli are in place by 8-10 weeks of human development.” Which clearly states her own scientific belief that a fetus can very likely feel pain even within the first trimester. At http://www.webmd.com/women/tc/abortion-reasons-women-choose-abortion, Its declared that the most common reasonig behind abortions are birth control failure and the inability to successfully support a child. Neither of these causes require ending the pregnancy. Although, there are no national statistics, there have been past expert estimates that there are somewhere between one and two million couples looking to adopt. At http://www.pregnantpause .org/adopt/wanted.htm, It’s stated that of approximately 1.3 million abortions, only around 4% of women with unwanted pregnancies give up their child for adoption. So why are women choosing to end their child’s life? Better yet, Why are we allowing them to? In conclusion, I believe abortion should most certainly be illegal. Although, it may be the mother's body, it’s the developing human child’s rights we are talking about. So, I ask as you carry on throughout your presidential term, that you fight for these innocent beings' unalienable rights precisely as you would with any fully developed human. 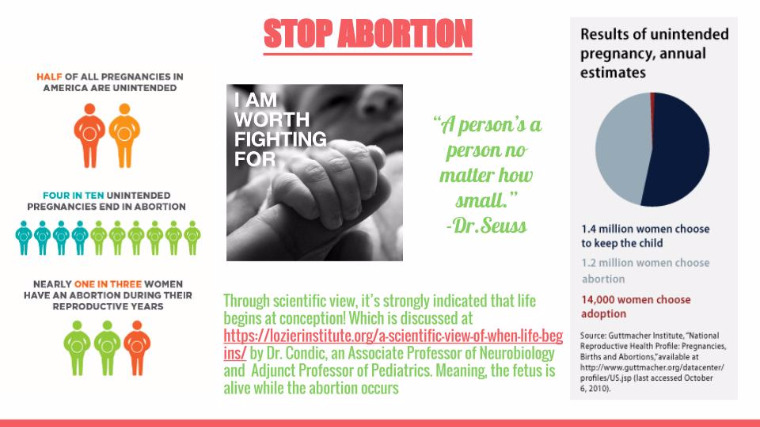 Because, as Dr. Seuss once wrote, a person's a person no matter how small. This is where Mrs. Roberts' students will write persuasive letters to the next president, using persuasive strategies. As the use of electronic devices advances, the more cases of cyber bullying will occur. Speak Up For Those Who Cannot Speak For Themselves: Stop Animal Abuse! My letter explains my opinion and why kids should have a say in the community. Abortion should be illegal because it denies the fetus its natural rights to live, and some may think it is a form of contraception. My letter is about why abortion should be illegal.